The Zyliss Utility Knife is an all-purpose knife for slicing, peeling and cutting fruits and vegetable, breads and meats. It has an ergonomic handle with soft touch grip for precise cutting and control. 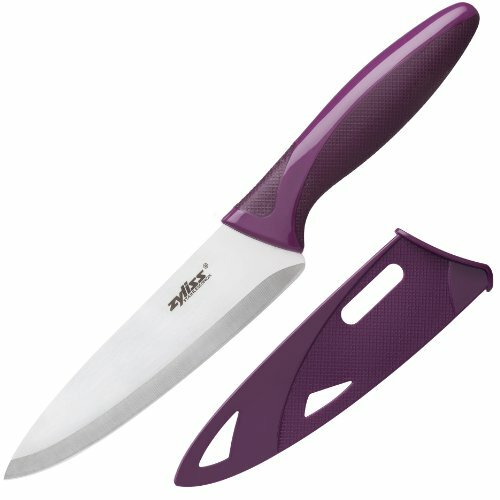 Includes protective sheath that covers blade for travel and storage. By Zyliss. Zyliss is a Swiss company that's been around for over 50 years. They're internationally known for their finely crafted hand-held kitchen tools. Legendary durability quality and engineering, Zyliss tools have been a favorite in the United States for over four decades. All of the Zyliss products are made of only the finest materials using the most modern production methods. Each Zyliss tool is precision made and undergoes stringent inspection before being introduced to the market. If you have any questions about this product by Zyliss, contact us by completing and submitting the form below. If you are looking for a specif part number, please include it with your message.